I have been thinking of entering the Moxie Fab World challenges for quite a while now, so when I had some time this past weekend, I made a card for the Emphasize the Negative challenge. The design is quite simple, and it was easy to make. I started by embossing the flourishes and the sentiment with gold embossing powder. I placed the stamps where I wanted them to be, then used my stamp press to mount them all together. I usually don’t use the stamp press, but it does make this kind of arrangement fun and easy! Next I die cut the hearts using a Cuttlebug die (it has three concentric hearts). Took the smallest heart and inked it up with Stampin’ Up! Rich Razzleberry. Finally, adhered everything in place using foam tapes. I tried to match the sentiment with the “heart within a heart” design. Other: Cuttlebu Heart die, versamark ink, Inkadinkado Gold embossing powder. Aside from the great design, I love the way you interpreted the negative challenge! The way you created the idea of a negative flourish by stamping across the gap is so brilliant!! Lots of negative dies, but I’ve never seen anyone do a negative stamp … love it!! I’ve got those flourishes and couldn’t remember who made them – thanks for the reminder! I love the flourishes, I have that stamp set and it’s beautiful. Your card is so elegant Tasnim. The inked heart with the touch of gold embossing is wonderful. Very pretty card….I love your style. I do see all your posts via email and love every card…sorry i don’t often comment, but I’ll try to express my thanks for your inspiration more often. Keep up the great “art”. As Kelly said, absolutely genius to emphasise the negative in your stamping! 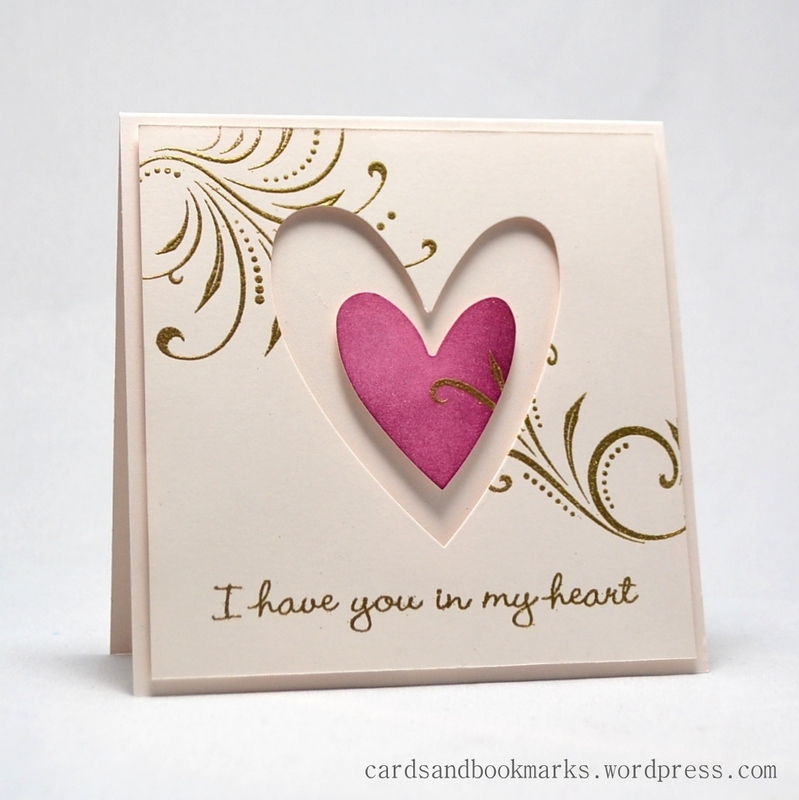 A beautiful design, love the touch of gold embossing and that coloured heart. Gorgeous!! This is a knckout card! Your talent for creating simple but extraordinary cards is so unique. It’s especially inspiring to me because I’m fairly new to this and don’t have bunches of tools and stamps but I know I can still make a card that is a work of art. Thanks! I love this design Tasnim~it’s beautiful! So lovely Tasnim . I must get out my flourish stamps . Thank you for sharing this idea. Awesome card Tasnim. Love the gold flourish and how it flows onto the heart too. What a beautiful card! The gold embossing is just gorgeous! This card is breath-taking – so, beautiful in its elegance and the sentiment is touching. I love it.